As you advance in your leadership career, you face increasingly complex issues and decisions, changes in patient care delivery, and resource constraints. This course will help you tackle those challenges head on! This engaging 3-day program combines lecture, self-assessment, discussion, and small group activity. It is followed by 3 one-to-one personal coaching sessions. Faculty include expert nursing executives from the Johns Hopkins Health System and Johns Hopkins University School of Nursing. This is truly a unique opportunity! Included with this course are 3 one-hour individual executive coaching sessions by International Coach Federation-accredited experts from DRW Coaching, Inc. In addition to creating an opportunity for leaders to experience coaching first-hand, this supports the goal to ensure knowledge you gain during the program will be assimilated and practically applied once you return to work. Following the introductory call, three coaching sessions will be facilitated over the course of 3 months. Session 1: Explore overall learnings, insights, and identified developmental needs. Specific goal(s) for development and initial strategies to support growth will be defined. Session 2: Coach and leader will connect within one month of session 1 to discuss insights, progress, challenges, and next steps. Session 3: Coach and leader will, again, connect within one month of session 2 to discuss progress, insights, challenges, and ideas for continued progress and sustainability. See You At The Ball Park! Baltimore is a baseball town and we would like to “take you out to the ballgame!” The Orioles will be playing the Chicago White Sox on Friday, May 5th at 7:05. A complimentary ticket and transportation to Oriole Park at Camden Yards is included with your registration. What a great way to end your 3-day leadership course – baseball, peanuts and Cracker Jacks! Don’t miss an opportunity to visit one of the top ranked baseball stadiums in the USA! Registration fee: Includes all course materials, three individual one-hour executive coaching sessions, daily continental breakfasts, and lunches, ticket and trasnportation to Baltimore Orioles baseball game, and certificates. Accommodations: The Admiral Fell Inn is offering rooms at a special rate of $149/night plus tax. When reserving your room, please request the Hopkins rate. (This discount does not apply if booking done through a 3rd party, e.g., hotel.com.) There are also many other hotels in Fells Point and Harbor East areas within walking distance. Group Pricing: For groups of 3 or more from the same organization registering together and JHHS/JHU SON nurses- special pricing available at $2295 per person. This course is a natural progression from our Nursing Leadership Academy, although it is not necessary to complete that program before enrolling in this course. Perfect for experienced nursing leaders who need to learn strategies and skills to manage the dynamic changes of the healthcare workforce and system. Identify outcomes of transformational leadership. Describe the key attributes of transformational nurse leaders. Identify strategies to use to develop transformational leadership qualities. Identify business models for health care organizations. Describe fundamental concepts of economics. Describe strategies for managing financial and human resources. Using the Conflict Dynamics Profile (CDP®) instrument, develop insights surrounding one’s natural reaction to conflict, including their strengths in responding to conflict and opportunities for personal growth and development. Manage situations and individuals that provoke and escalate conflict by identifying personal “hot buttons” that can destabilize the situation, and by implementing “cooling strategies” to defuse tension and regain focus on outcomes and objectives. Identify specific strategies for greater competence and confidence moving forward. Identify strategies for asserting your views and achieving outcomes through engagement of stakeholders. Identify practical solutions for handling difficult negotiations. Complete the StrengthsFinder 2.0 assessment. Describe how to use your strengths to maximize your leadership ability. List the four basic needs of those who look to you for leadership. Differentiate coaching from related disciplines, including mentoring, management, counseling and training. Describe a basic coaching framework to support effective coaching conversations. Practice coaching, including the skill of powerful questioning, to support transformational coaching skills and confidence. Describe strategies for developing a leadership succession plan. Identify mechanisms that provide for early identification and mentoring of staff with leadership potential. 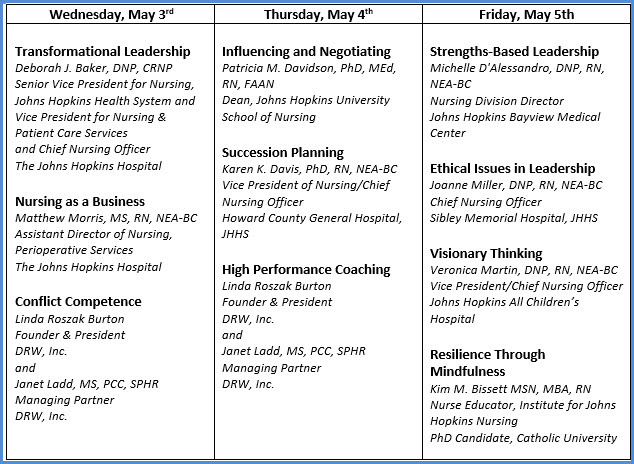 Describe methods for mentoring current and future nurse leaders. Identify principles for upholding ethical standards in leadership. Describe actions to take in select ethics-related case studies. Describe the use of systems thinking in problem solving and decision making. Identify key components of strategic planning. Describe the impact of nursing decisions on the healthcare organization as a whole. List examples of innovative thinking/planning, including innovative staffing/care delivery models. Identify 3 ways mindfulness improves leadership. Formulate a plan to integrate mindfulness practices and strategies into your life. Statement of Contact Hours: This 20.0 contact hour educational activity is provided by the Institute for Johns Hopkins Nursing. Cancellations: All cancellations must be received in writing 2 weeks prior to the event. Cancellations received 2 weeks prior to the event will be refunded the event cost less a $200 administrative fee. We are unable to make refunds after the 2 week deadline. IJHN reserves the right to cancel or postpone any activity due to unforeseen circumstances. In this event, the IJHN will refund the registration fee but is not responsible for travel expenses. Photo Permission: During the event photos may be taken for IJHN promotional purposes. To opt out click here.